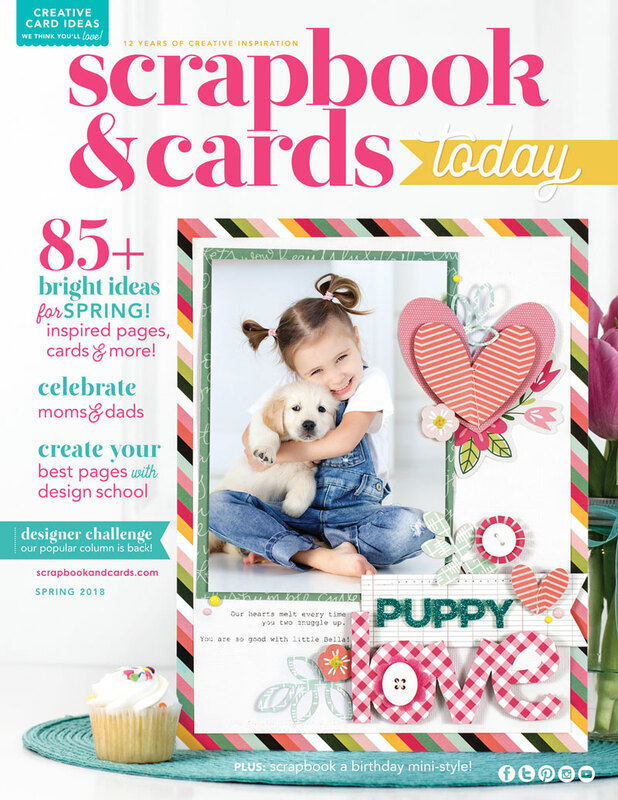 Hello Spring Issue of Scrapbook & Cards Today! Ahhh… spring is in the air… the days are getting longer… those occasionally annoying birds are getting louder… and the new issue of Scrapbook & Cards Today magazine is out now! The spring 2018 issue is packed with fun layouts and cards for spring and more, and I’m happy to share a few of my pages here today! 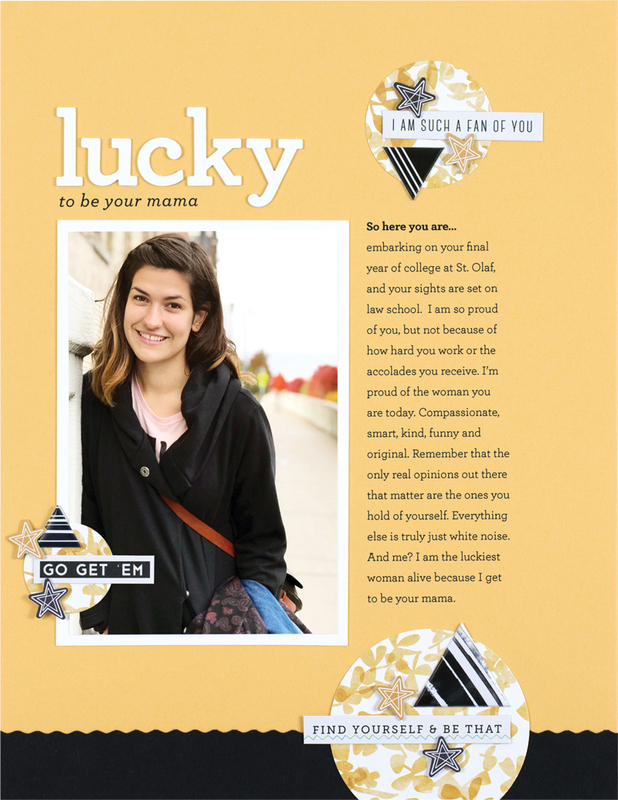 Normally, I just do two layouts for my Design Your Story column, but I created one more page for a brand new column called—be still my heart—Design School! We’ll be focusing all year on teaching different topics of design as they apply to both card making and scrapbook page layout. Now you know I love a good story and I LOVE comparing time spans, right? 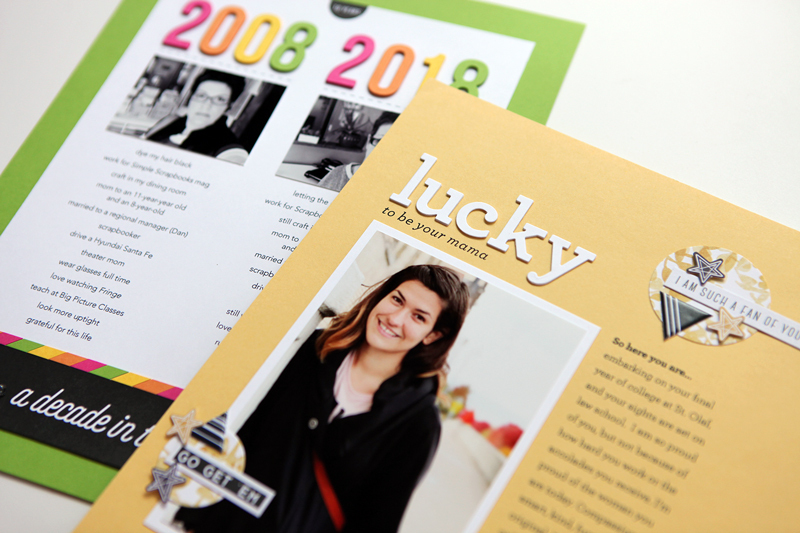 My topic for the spring issue of Design Your Story is scrapbooking about you! While I’ve covered this before, I always need to come back to the topic to encourage women (and men!) to tell their stories. You can read more about it in the column, but here are the layouts. Can you document a decade in the life? When I came across that first photo—a selfie taken with a point-and-shoot camera in the pre-smart phone era—I knew I had a fun idea to make a page about yours truly. While I’m happy to report that I mostly resemble the same person a decade ago, it’s wild to me how things have changed on every other level. And, of course, how some things have not. 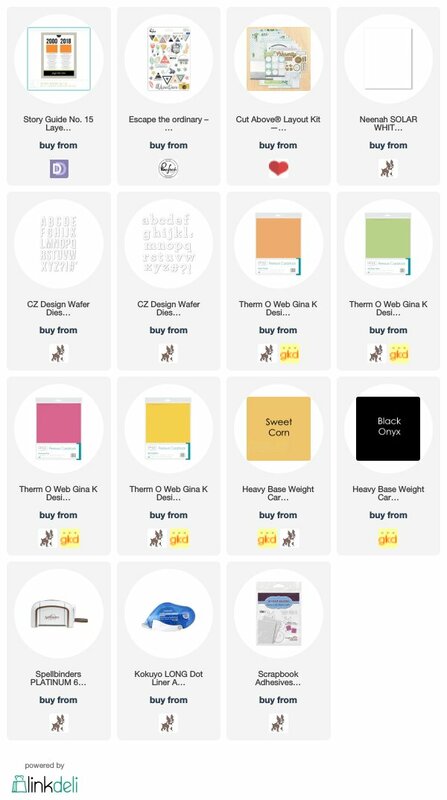 And because I like to make designing stuff like this easy, I just released the corresponding layered template today in my shop at Designer Digitals, which can be the perfect base for a hybrid layout like the one I created. Next up, another page about me, but this one is more reminiscent of my Present Participle series here on the blog. I know it can be hard for some of us to scrapbook about ourselves, but if you take a fill-in-the-blank approach, it can seem a bit more doable! I used a layout kit from Close to My Heart to create this page, adding in my own typed circles for the journaling. 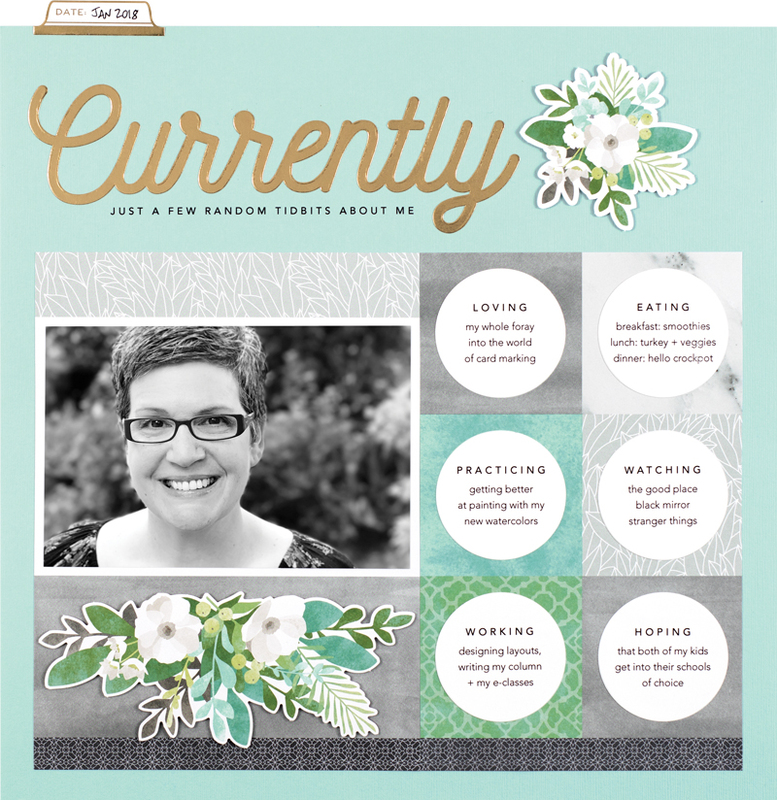 (You can download my free circle journal layered template here!) I also added the subtitle and printed it onto my background cardstock using my wide format ink jet printer. I just eyeballed where I thought it should go to line up just below the gold metallic “currently” title. Using the active ing words, I simply chose a list based on what was in this kit already, and typed up my answer. The kit paper comes with a words already in the circles, but sometimes I don’t feel like using my handwriting, and that’s why I created my own. These are small details. This is not a hard way to tell your story. It might be challenging to get a photo of yourself, but heck, take a selfie or hand your phone off to someone else. My daughter snapped this shot of me using the Portrait Mode on my iPhone 7 Plus. Easy and done. My final page in the issue (found in the Design School column) features a simple message to my incredible daughter, who is officially headed to law school at the University of Minnesota. I love the simple gatherings of embellishments from Pinkfresh’s Escape the Ordinary collection, and the contrast of the white die cut title with the yellow and black of this page. OUR DESIGN TEAM ROCKS! All in all, I’m really happy with the layouts I created for this issue, but seriously, go check out the full issue because our designers blow me away. There are moments when I’m laying out the magazine and I see what designers like Nicole Nowosad and Lisa Dickinson create and I’m all, “I could never come up with that!” Or Stacy Cohen and Paige Evans… honestly, we have hella talented designers that make this magazine a joy to be a part of. And I can’t quit there: Virigina Nebel, Sheri Reguly, Melissa Phillips and Meghann Andrew literally hit home runs every issue, and our newer team members, Anya Lunchenko and Latisha Yoast are inspiring the heck out of me. It’s… how do you say, an embarrassment of riches! And like I said, it’s a pleasure to be a scrapbooker who also happens to be an art director and gets to work with what these ladies create. CHECK OUT ALL THE GOODNESS! Click here to visit the home page for the spring 2018 issue and check out everything online today! Well you are kind! I just know that I don’t work product the way some designers do, and I really admire that skill! Congratulations to Aidan for choosing a law school! I love getting my paper copy of the magazine. I slowly read it from start to finish, and then read it a few more times! I wish that there was a couple more issues per year. I wish we had the staff to do more issues! But we are a small and mighty back end team! Yes! Thanks for the catch. It has been updated! these pages are amazing! Classic Cathy and I love that. Cathy, I think the photo in “Currently” is the best I’ve ever seen of you! You look so pretty and happy. Love the colors, too. And thanks for the circles freebie! Loved the decade layout. Have purchased your template and made it already. So happy with the result. Thanks. 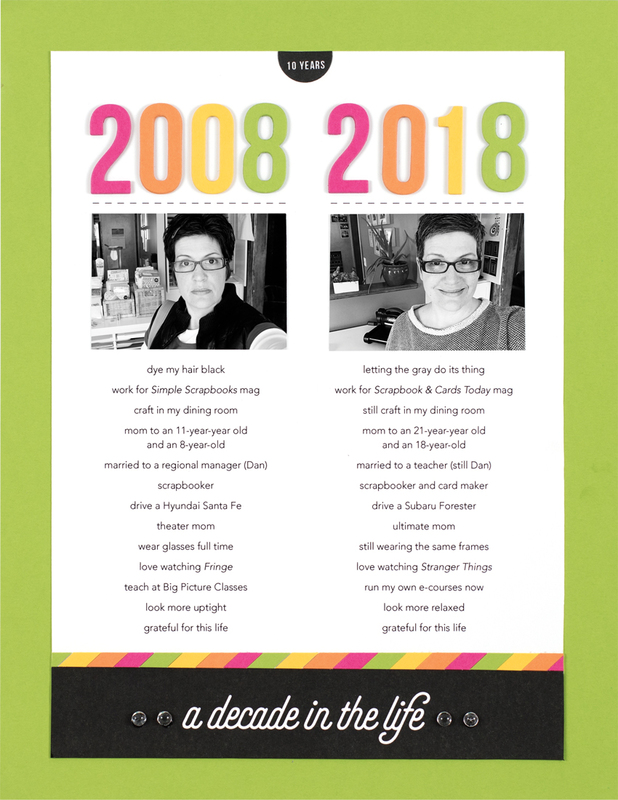 The decade page is a GREAT idea! I’m so doing that! Thanks for the inspiration as always. Cathy! You are making me itch to start scrapbooking! I love your scrapbooking style. I knew nothing of the hybrid style or the clean look of your layouts. Oh my goodnesses (as my little one would say) these are amazing! And, yes, you deserve credit for being an amazing member of the team!! YASSSS! YOU SHOULD! I have a class launching on Monday… just sayin…..
Oh my gosh, Cathy! I love these layouts. Gonna have to buy this magazine. I’m a fairly new subscriber to your newsletter. An avid listener of the Scrap Gals Podcast. I had listened to their interview with Jess Forster two days ago and began listening to her Pocket Talk podcast for her interview of Tracie and Tiffany. They mentioned that she had just interviewed you. I just listened to THAT podcast today and was super excited to check out your new class…”Design Your Life 2.0″. Wasn’t sure I wanted to spend the mula right now. However, after reading the blog post with your layouts for this issue of the magazine, I decided to take the plunge and purchase your class! The podcast actually totally convinced me that it was what I’d been looking for! 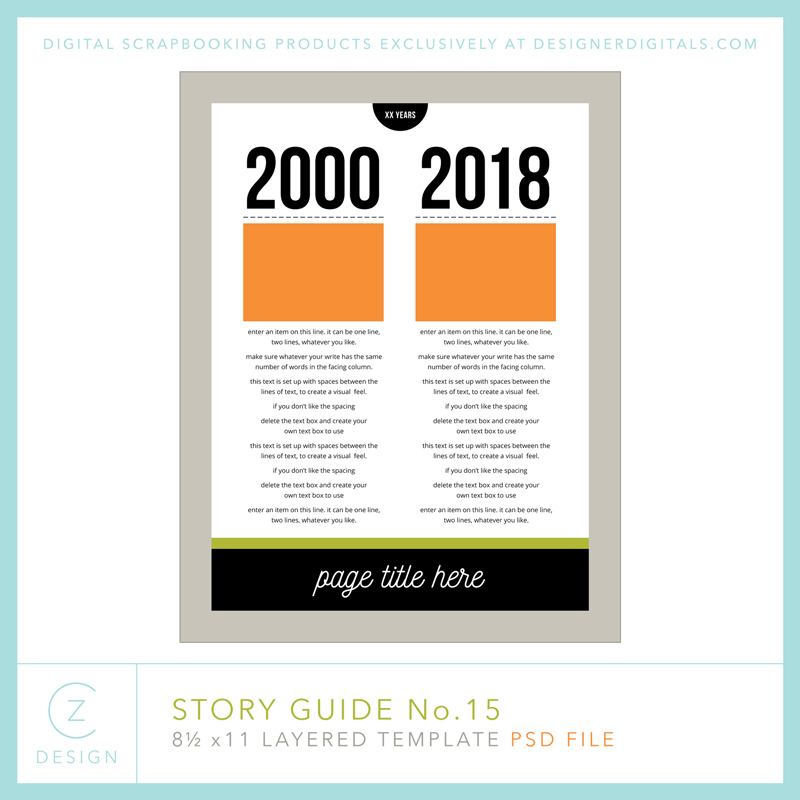 And after seeing the journaling for your “Decade” layout and also mentioning this subject on your “Currently” layout…I KNEW I was on the right track. You said you’re a fan of “Stranger Things”! Yes!!! My husband and I began watching that last month upon the recommendation from our son and his wife. And WOW! Okey dokey! I am sold. Can’t wait to begin tonight working on the first class. I am old…73…actually have kids your age! Ha Ha! And I consider myself quite techy. However, I do struggle with Photoshop Elements and really, really want to do some layouts using mine. I have version 14. But I also want to learn more about PE in general. I feel this is a way to get my feet wet. Thanks so much for teaching this class! Love your style and sense of humor. You have a new fan here. Hope you don’t mind the long post!! Hey Sherrie! SO glad to have you! Love a new fan and super happy to have in class. If you have any questions, don’t hesitate!